How it all began? –SPACE was founded in 2009 as a lose group of Flash coders, interactive designers and computer scientists, rooted in the Markenfilm universe as task force for (back then) complicated media productions that required some IT savvy knowhow. More and more, agencies focused on interactive YouTube specials, film-driven microsites and multimedia installations. We were the media glue between film producers, agency, freelance tech experts, consulted, estimated and researched a lot to bring productions from paper boards into digital life. Suddenly, there were far more project proposals by agencies on our desks that involved communication in space. The ADC added a special panel in 2010: The “Out-of-Home” (OOH) panels added a section that addressed specially communication works, mainly installation, in public space. This was our new playground. Our „ménage-à-trois: Three pillars for shaping a successful, impactful media experience in space. 2013 we won the ADC Grand Prix with our production “Invisible Drive” for Mercedes Benz (Agency: JvM). It still is a great example of the “ménage-à-trois” in spatial communication: We understand CONTENT + TECHNOLOGY + SPACE as vicious triangle that defines the pillars of a successful media experience in space. These three aspects need to be balanced out in media campaigns and productions to really create an effective impact on the audience. With the “Invisible Drive”, we may have found and designed a great experience to do exactly this: Bringing content and a certain message alive, using a great set of technology in a public space. 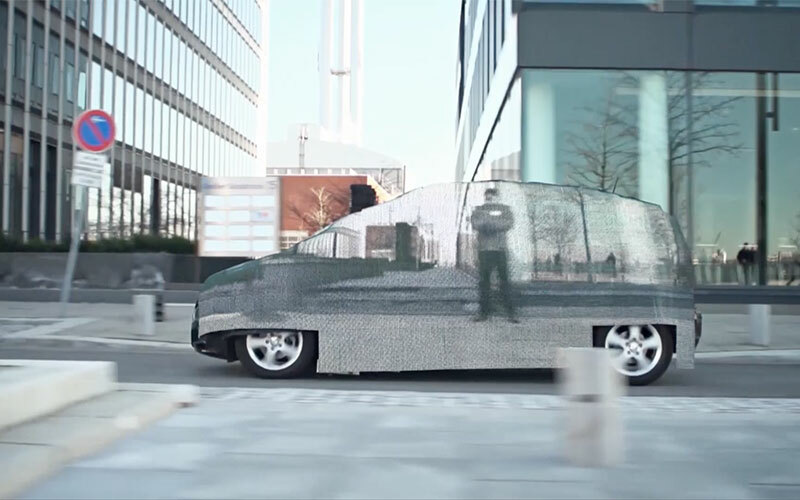 The F-Cell by Mercedes was “invisible to the environment” – and our installation communicated this in a way unseen before. At the very beginning, there just the short question if there is „any chance to make this car invisible?“. Step by step, together we worked out the approach how to create the camouflage effect for the car, using special LED technology. The LED tiles used were so brand-new on the market, we had to fly them in from Amsterdam. We did an early prototype test to double check the visibility (or “in-visibility”) of the car. The result was amazing and we knew this would work. At the end, we released the case-film of the event on a Friday on a website, went into the weekend, and had several million views when we returned into office on next Monday morning. It proved the mix of tools, message and space was just right. CONTENT production needs to take in to account the situation it will be displayed, the technology it will run on, as well as the space it will be set into scene. TECHNOLOGY needs to be picked and administrated according to the content to be transported, taking into account limitations and possibilities of the existing space. And SPACE needs to be respected in regard of its surrounding parameters, influencing the selection and design of content as well as technology. 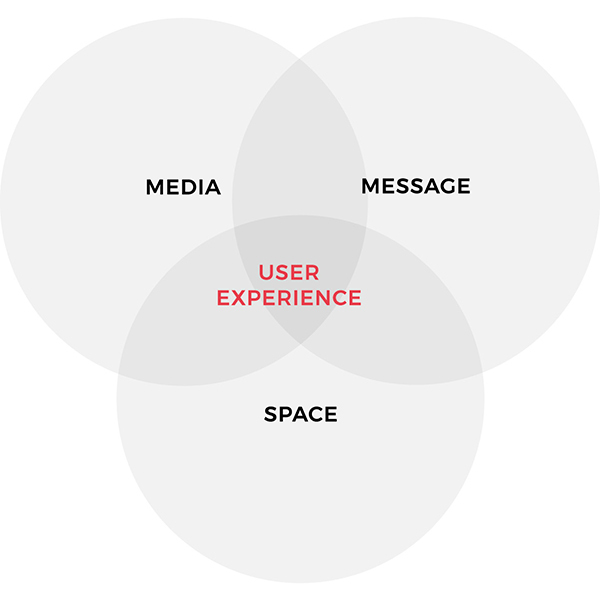 At the end a balanced setup of these three components is crucial for a strong user experience. SPACE grew over the last 10 years. Technologies have changes. Habits of communication have altered. But the “ménage-à-trois” of SPACE + TECHNOLOGY + CONTENT remains. We keep this as concept in our heads, for all new and upcoming productions. All this to shape an impressive experience for you. –Get in touch !